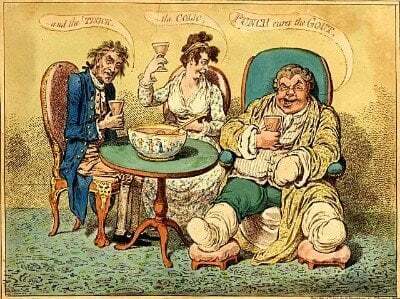 Pancakes and gout is today’s topic for my 97th most popular search for gout. Like many of the topics near the end of your Top 100 gout topics, pancakes were in detailed food charts designed to help plan an alkalizing gout diet menu. Pancakes are not particularly important to gout sufferers, but if you eat a lot of them, you should know one key fact. I should mention the futility of worrying about single food items. However, as I covered it in yesterday’s topic, I will focus on one aspect of pancakes that might be slightly relevant to gout sufferers. 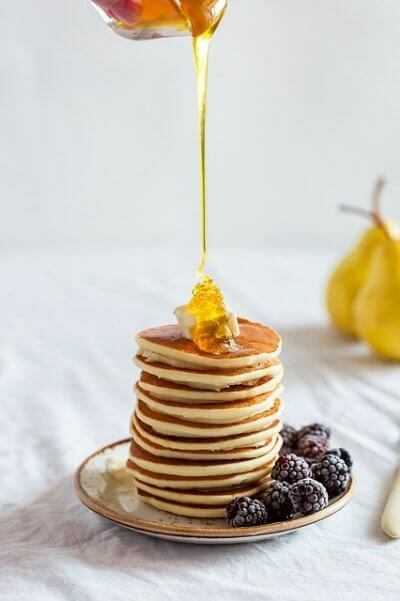 There is no direct connection between pancakes, or their ingredients, and uric acid. However, pancakes have one significant property that has an indirect bearing on gout. They tend to be acid-forming. Acid forming foods are required as 20-30% of what we eat, but typical Western diet has too many acid-forming foods and too few alkaline-forming foods. At this point, I would love to bring you an alkalizing pancake recipe, but I do not have one. There are several recipes on the Internet that claim to be alkalizing, but I fear they might be using the wrong data to assess the effects of ingredients. In theory, as pancakes are rarely eaten without toppings, it should be possible to produce a combination that is alkalizing in total. The most obvious place to look for effective toppings is my list of high alkaline foods. It has not inspired me yet, but I have limited culinary skills. If you have a recipe for pancakes that would form part of a good gout diet menu, please share in the gout forum.